When you make your tribute gift to thank, to honor or to remember someone, you’re ensuring healthcare excellence is available for community members today and for generations to come. To remember loved ones who have passed. You have access to special recognition opportunities when you combine your tribute gift with that of friends and family members. In doing so, you may designate your gift to the program or service that means the most to your family. A gift of any amount acknowledging a caregiver or group for exceptional medical services and personal caring. Gifts may be designated to support a program or service of your choice. Individual Halo recipients receive custom-crafted lapel pins to wear proudly; group recipients receive a Halo certificate to proudly showcase in their department. We provide you or your funeral home with suggested obituary language, including where gifts should be mailed and how checks should be made payable. We also provide personalized memorial gift envelopes that we will deliver directly to the funeral home. 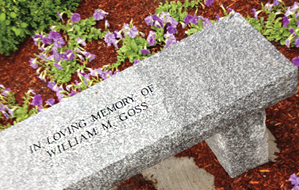 We suggest the following language ~ In lieu of flowers, the family has requested memorial contributions be made in the name of (name of deceased) to support the (name of Hospital program) at Concord Hospital. Contributions can be mailed to Concord Hospital Trust, 250 Pleasant St., Concord, NH, 03301 or made online at ch-trust.org.